Anti-Spam enables you to archive email based on domain information, a specific email address, by sender or recipient. When a match is found, Anti-Spam archives the email by Blind Carbon Copying (BCC-ing) it to the specified email address. The archive email address can be different for each match. 1. Go to Email > SMTP > Archiving. • Match domain or address — Specify either a domain or an email address to match. • Archive address — Specify the email address that matched email is forwarded to. • Match recipient — Specify that matching of the domain or address should be performed against the recipient’s email address. 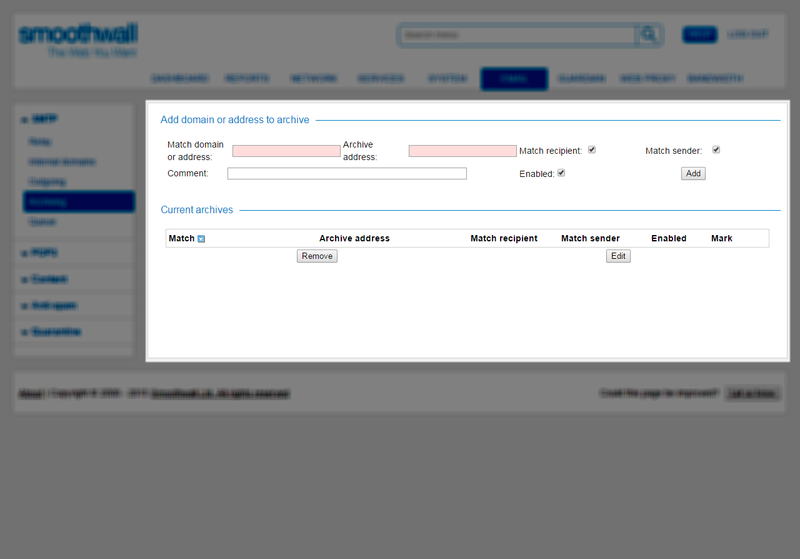 • Match sender — Specify that matching of the domain or address should be performed against the sender’s email address. • Comment — Enter an optional description of the archive. • Enabled — New archives are enabled by default. Clear the check box to create a disabled archive. 1. Go to Email > SMTP > Archiving page. 2. In the Current archives list, select the rule and click Edit. The rule’s settings are displayed in the Add domain or address to archive area. 3. Make the changes you require and click Edit. The rule is updated in the Current archives list. 2. In the Current archives list, select the rule and click Remove.